Union Book bookshop operates within Singapore’s Bras Basah Complex, at 231 Bain Street. 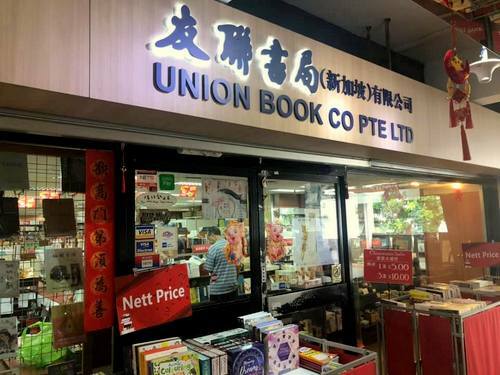 Founded in 1952, Union Book Co Pte Ltd is a trusted Chinese bookseller, offering books in a wide range of categories. The company sources books from China, Hong Kong, Taiwan, New Zealand, Malaysia and other regions, and has close business contacts with major publishers, mainly engaging in Chinese book retail, wholesale, and also selling stationery & gifts. …Lifestyle, Philosophy and Religion, Fiction, Sports and Leisure, Recipes & Cooking, Miscellaneous, Art Design, Comic World, as well as Political Affairs. The official Union Book Singapore Facebook page is located at www.facebook.com/unionbook.com.sg/. Following the Facebook page, you’ll receive updates about the bookstore’s promotional offers, their literary events, plus more.